How is one supposed to have a cookout in the rain? The forecast isn’t promising for this evening and it is foggy this morning portending a very humid day. Supposedly the rain will clear for a bit around cooking time, but I can’t count on that. So, as I had to do last year as well, I set the table inside. I did it yesterday afternoon so I could get pictures and show you today. If it clears up, it won’t take more than 10 minutes or so to move the whole thing to the veranda table. I started with covering the table with a piece of white plastic, and covered that with a white cloth to protect it, bratwurst can get a bit juicy. 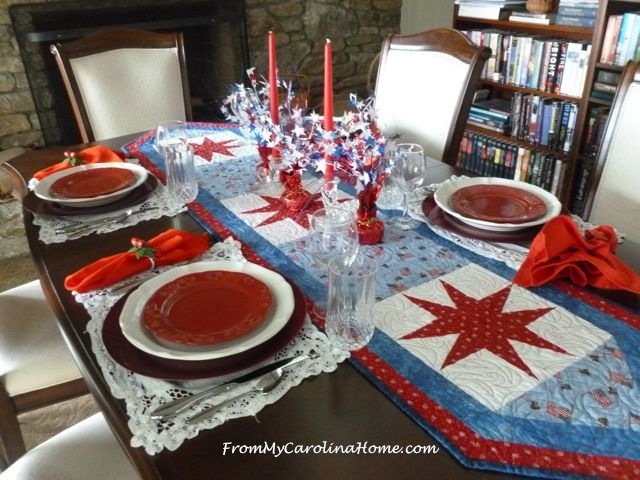 The Patriotic Table Runner is one I made a couple of years ago using a tri-recs ruler for the stars, and patriotic fabric for the squares. 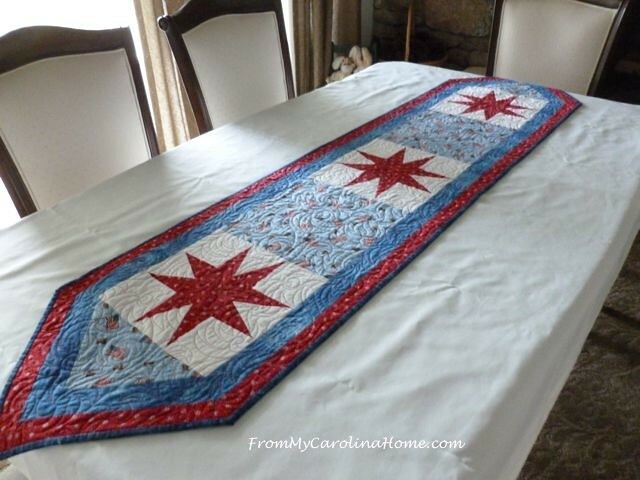 Click on the name for the free quilted table runner tutorial and pattern. 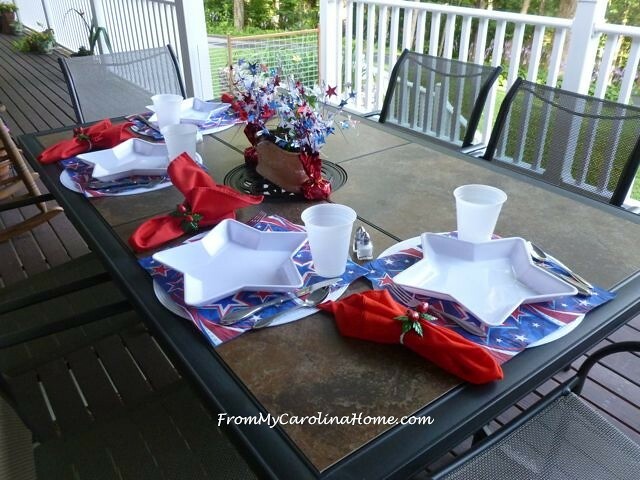 The white star melamine dishes came out, and were dressed with a bit of star garland in blue and red. The “vase” for the flowers is a jelly jar. 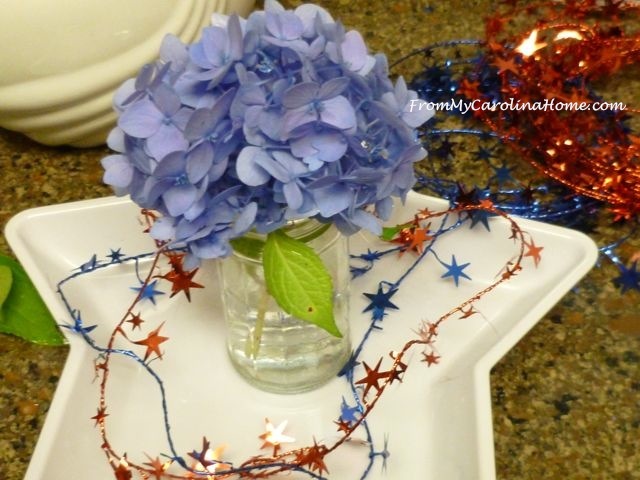 The hydrangea had a couple of small flower heads that were more blue, so they were added to the vases. I did two of these to go on either side of the center. The red salvia in the white planter was brought in from the veranda to be the focus of the centerpiece. The star plates were set on either side, with two star sprays that I got at a dollar store some years ago. 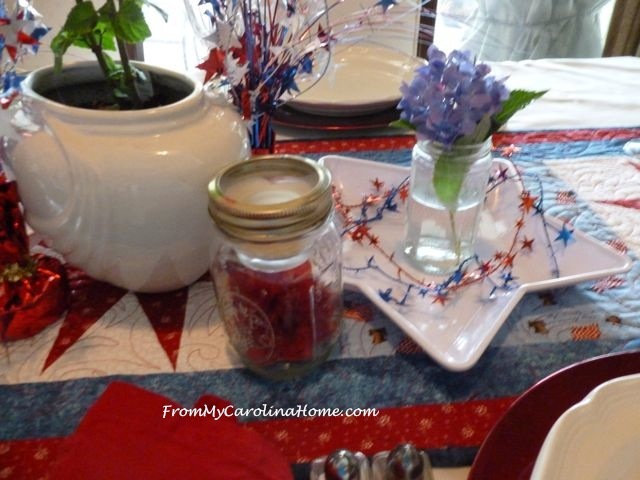 There was just a bit more needed to fill out the centerpiece, so the Mason Jar Candles with red flowers were also added. 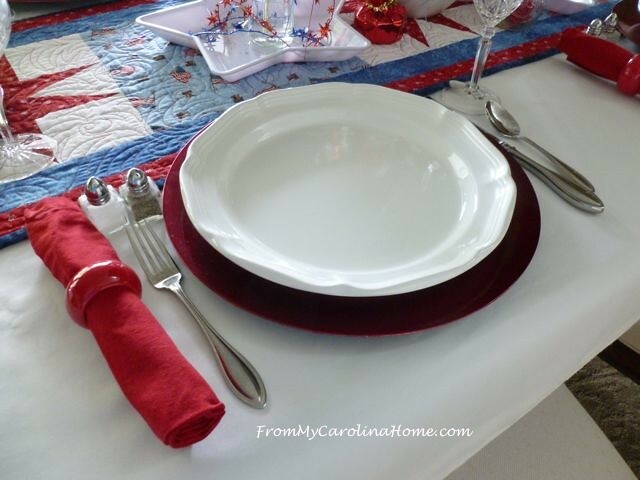 Place settings were casual as usual for a cookout, with everyday flatware, red chargers and white stoneware. No salad plates as we weren’t going to need them. Red napkins got red rings. Then I had another idea. I thought rolling the red napkins would make them look like firecrackers (or dynamite, LOL!! ), so I did that. That’s fun, something different than the napkin shape I usually use. Wine glasses were added as well. Now, the table is set and ready for guests. No place cards for this meal, it is just casual. I’ve left the four corners for serving dishes. Our guests are bringing side dishes to share, and if they need a dish, we’ll use these. 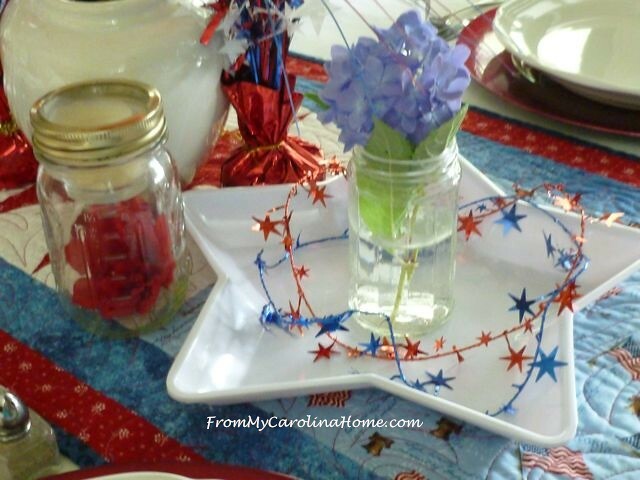 Another look at the star plates with the garland and hydrangea, and the mason jar candle. Ready for spending time with good friends. The big flag platter will hold brats and burgers and buns. 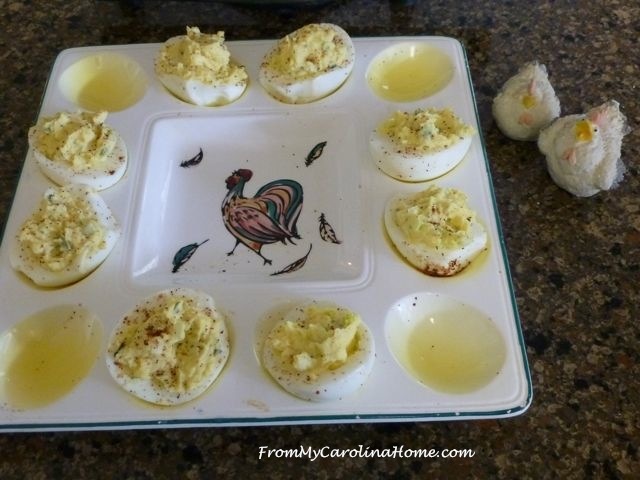 I always make some of my Perfect Deviled Eggs for cookouts and picnics. This year I’ll make a cucumber salad as well, from a couple of huge cucumbers a friend gave me. Need more inspiration? 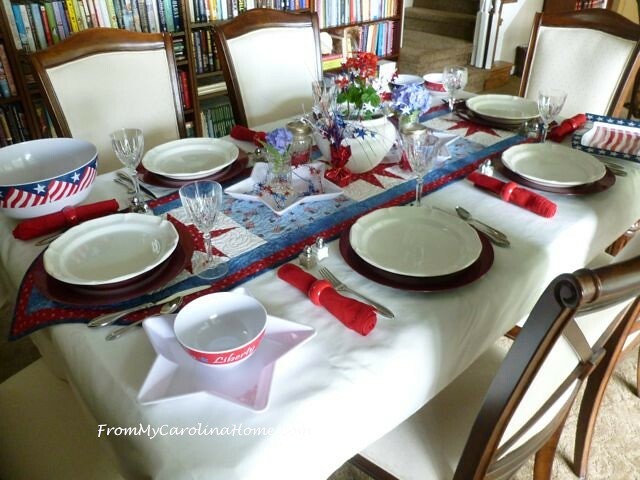 You can see some of my previous tablescapes at these links. 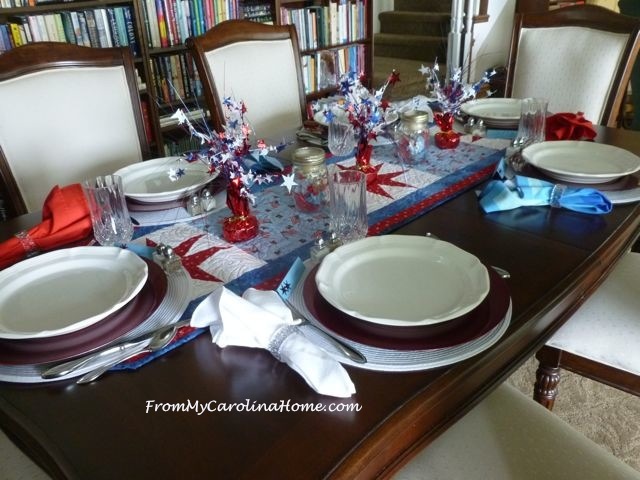 Patriotic Tablescape 2016 – white placemats, red chargers, and three colors of napkins with clear acrylic rings because I didn’t have six of any one color. 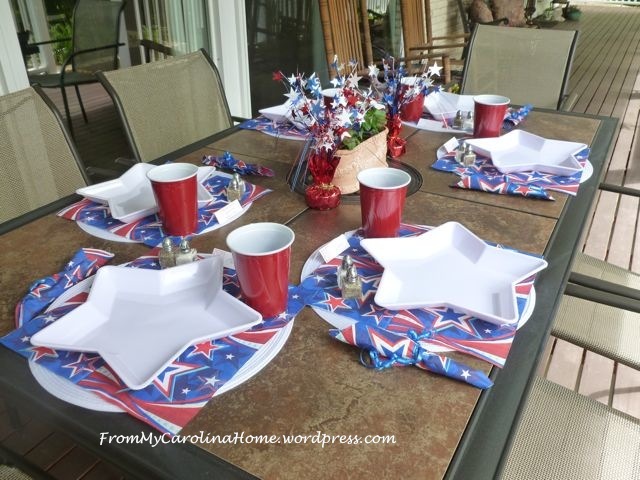 and outside with paper napkin chargers and the melamine stars as plates! Strawberry napkin rings hold red cloth napkins. Star sprays flank a planter with white petunia. 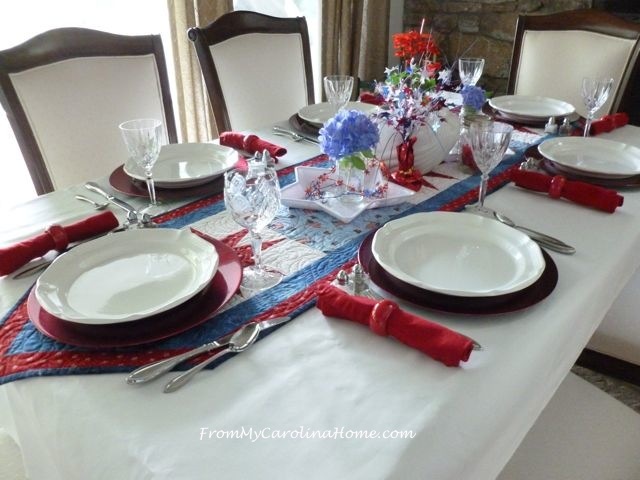 And here is the veranda tablescape from an early July Red White and Blue Luncheon I had with friends two summers ago. This time I rolled the plasticware inside paper napkins and tied them with a blue ribbon. I hope you have a wonderful July 4th holiday, time spent with family and friends with lots of fun and fireworks!! Your table looks absolutely amazing! Have a great holiday! Beautiful, Carole! Your guests will feel honored. Hydrangea are one of my favorites. It is wonderful to be able to imagine and use simple things to decorate with. You have great imagination with color schemes and arranging. I have a lot of deviled egg recipes from the internet, one of my favorite is the avocado and another is the shrimp or tuna eggs, check them out sometime. HAVE A GREAT FOURTH AND A SAFE ONE. I’m staying home and working on my weekend sale and praying we don’t get any rain. 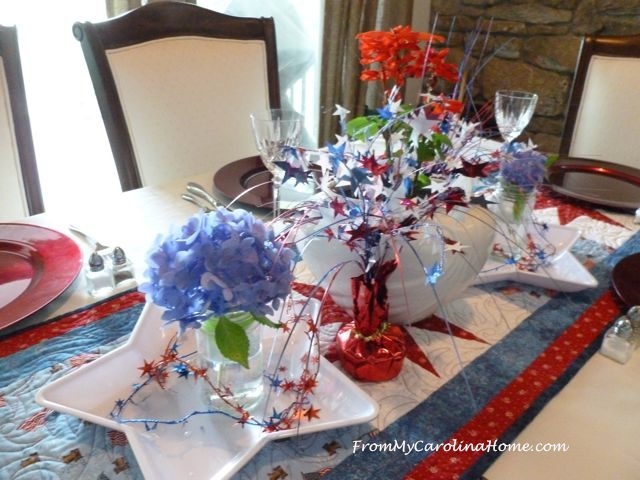 Your patriotic table looks so inviting! I want a devilled egg! Happy Fourth! A perfect table for the day made more so by deviled eggs. Happy Fourth my friend. I always enjoy your tables and am inspired to start making some seasonal table runners myself. :)V Enjoy your get together. Your tablescapes are always first-rate and very creative. Wherever do you find the room to store it all. My dining room table has been covered by my husband’s political memorabilia clutter for weeks. Can’t remember the last time we ate at the table. No plans here today, some yardwork and maybe a little sewing if it doesn’t get to warm in the studio. We’re just puttering & trying to get well for our trip to visit grands the end of July! Too many meds on the table to decorate. . . but on our patio, hmm, think I’ll see what I can make work! 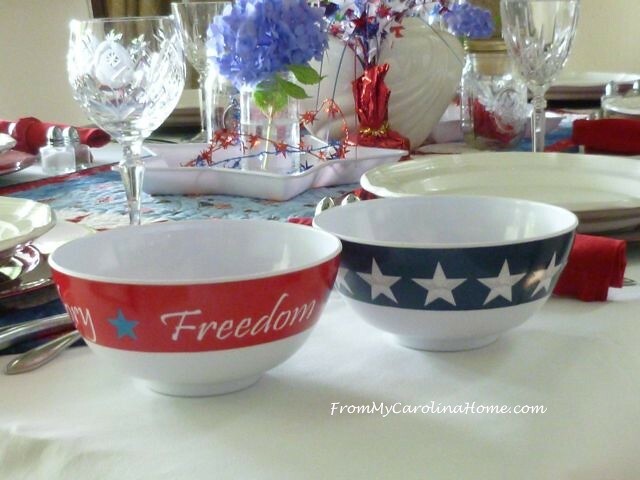 DH is grilling salmon in his Green Egg, & I know I have a couple patriotic placemats at least.. . . Glad this “crud” that struck last week (& has progressed), plus hub’s back spasms didn’t happen en route or at our destination. Always better to be sick @ home! Enjoyed YOUR montage of settings! How festive! Hope the rain holds off so you can enjoy eating outdoors. Love how you used flowers from your yard in your tablescape. We had our family get together and watched fireworks Saturday. 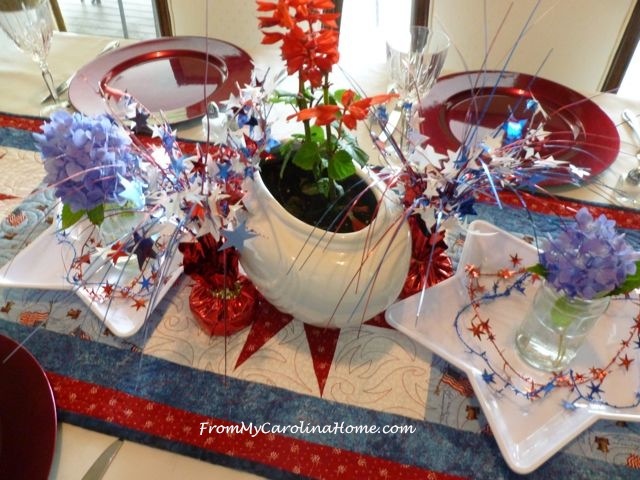 Red, white and blue makes my heart sing!! I’m sure your guests will appreciate your creative efforts and menu. Going to do some piecing on my daughter’s Bargello and listen to a Sherriff Longmire book on CD. May God continue to bless America as He has in the past. I love all of your table scapes. Our neighbors came over for dogs and burgers. We filled the porch with people and didn’t set a table, so I was happy to feast my eyes on yours. Our setting wasn’t pretty, but it was clean. John spent as much time cleaning and moving chairs as I did cooking. Happy 4th! Your table decoration is beautiful Carole, hope the weather stayed fine for you. No holiday here just the same old same old!!! Happy 4th to you. 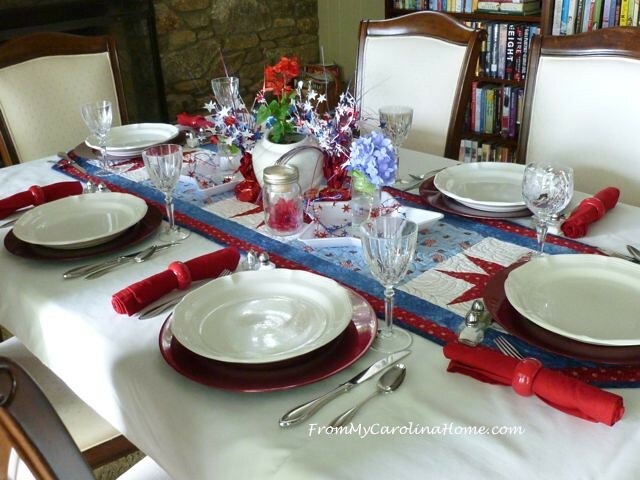 Carole, what a beautiful tablesetting! 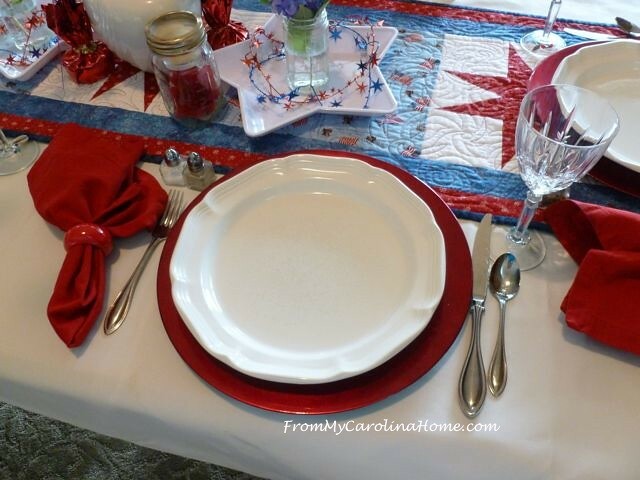 I love the patriotic table runner…perfect! 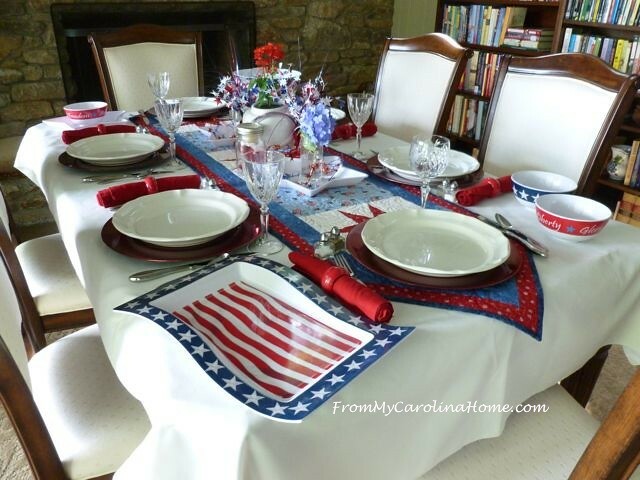 All your tablescapes for Independence Day are fabulous. Of course!